Once a month I report on the desktop operating system market share using data from NetMarketShare. The changes in fortune between the different flavors of Windows is usually fairly minimal -- a percentage point gained here, a percentage point lost there. And usually the rise or fall is a lot less than one percent, although as a month is quite a small time scale to measure market share changes over, and we’re talking about millions and millions of Windows users, that’s to be expected. I decided, out of curiosity, to take a look at what a year’s worth of market share variations would look like, using StatCounter’s Global Stats, and the results were less than thrilling, with the different operating systems showing very little change. In May 2013, Windows 7 had 56.27 percent. 12 months later it is on 55.03 percent. A drop of just 1.24 percent. Windows XP fell 6.73 percent, while Windows 8.x grew 8.16 percent. The pattern is clear -- Windows 8.x sales look to be coming from upgrades (mainly XP) but people are mostly sticking with their older operating systems. Open up the time scale however, and a more dramatic -- and damning -- picture emerges. 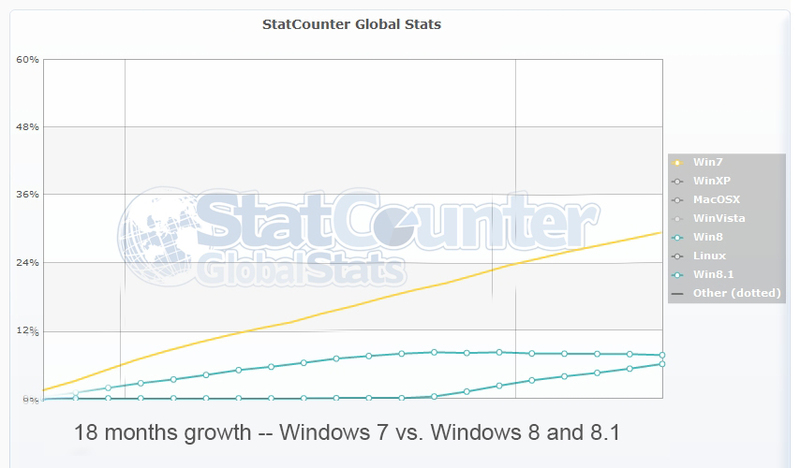 In July 2008 (when StatCounter started recording OS share) XP dominated the market with 75.07 percent. Today it sits on 15.84 percent -- a drop of 59.23 percent. But while XP was tumbling, Windows 7 was rising at a meteoric rate. It’s a clear upgrading picture -- one OS ceding to another, newer one. That picture is totally absent when you look at the impact that Windows 8.x has had. From launch on October 26 2012, Windows 8.x took 18 months (with a little rounding up) to get to where it is now -- 13.73 percent. 18 months after it launched on October 22 2009, Windows 7 was at 33.22 percent. At the rate it’s going (an average of 0.76 percent a month), Windows 8.x will take another two years to reach that mark, assuming users of other operating systems (Windows 7 and XP) decide they want to make the switch. Of course, the keyboard and mouse friendly improvements added in Windows 8.1 Update could see the tiled OS pack on market share at a faster rate, but it's too early to know. 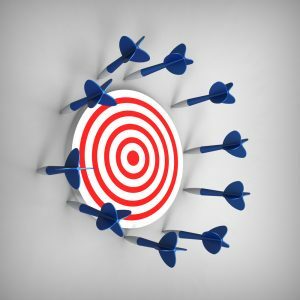 We can make excuses for Windows 8.x failure -- Windows 7 followed an unpopular OS, people were looking to upgrade from XP, and tablets didn’t exist when Windows 7 launched. And of course that’s all true. But here’s the thing -- Microsoft’s desktop dominance has only lost three percent in six years and is still at around 88 percent (most of that erosion is down to OS X). Remember, we’re talking about desktop market share, not users. Need a bit more convincing about the scale of Windows 8.x failure? Let’s look at the unpopular Vista. In the 18 months after it launched on Jan 30 2007, it had 16.87 percent market share, 3 percent more than Windows 8.x has now. Sure, it could be argued that people were clearly keener to upgrade from XP than they are to upgrade from Windows 7 (XP was a little over five years old at that point), but that’s a weak argument. No matter what you have, if someone offers you something better you’ll likely take it. And if you perceive it to be worse, you’ll leave it. Windows 8.x's slow growth, and Windows 7’s rock solid market share make it pretty clear what people think of Microsoft's "New Windows".